I am pleased to have your letter of 18 September – I have been up at the ranch for some time, and have just seen the letter. 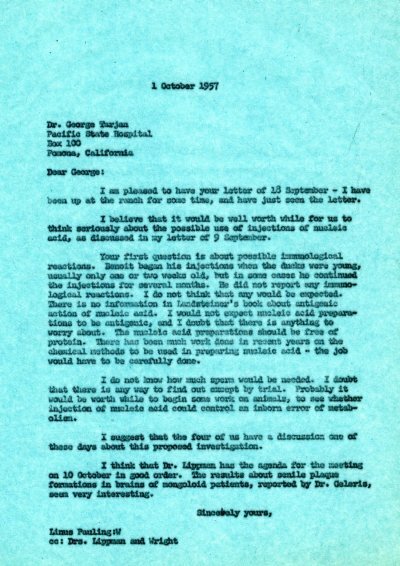 I believe that it would be well worth while for us to think seriously about the possible use of injections of nucleic acid, as discussed in my letter of 9 September. Your first question is about possible immunological reactions. Benoit began his injections when the ducks were young, usually only one or two weeks old, but in some cases he continued the injections for several months. He did not report any immunological reactions. I do not think that any would be expected. There is no information in Landsteiner’s book about antigenic action of nucleic acid. I would not expect nucleic acid preparations to be antigenic, and I doubt that there is anything to worry about. The nucleic acid preparations should be free of protein. There has been much work done in recent years on the chemical methods to be used in preparing nucleic acid – the job would have to be carefully done. I do not know how much sperm would be needed. I doubt that there is any way to find out except by trial. Probably it would be worth while to begin some work on animals, to see whether injection of nucleic acid could control an inborn error of metabolism. I suggest that the four of us have a discussion one of these days about this proposed investigation. I think that Dr. Lippman has the agenda for the meeting on 10 October in good order. The results about senile plaque formations in brains of mongoloid patients, reported by Dr. Celeris, seem very interesting.